Living with the Tiger ~ The Wandering Soul's Wander Tales..
"It is easy to think the forest is beautiful and harmless sitting inside the safety of the vehicle but take 10 steps inside the forest, off the trail and you will see how scary it really is." Imagine walking on a cold winter morning in the dense jungle where the mist is so low and thick that you can’t see beyond few feet. Imagine this is a national park where wild things are, including the tigers and leopards. Imagine doing this alone with nothing but a baton in your hand. Sounds like a perfect set up for a gory movie? Only this is reality, for many of the forest dwellers living in the jungles of India. One afternoon in Kanha National Park, we were in search of that elusive king of the jungle, not the lion but the tiger. But it was an afternoon of no luck and wild goose chases. Sitting bored in the safari vehicle I sparked a conversation with the forest guard in our vehicle, Omkar Singh. He was a 40-year-old pleasant man with eyes that seemed to have known much action. After all he hails from one of the 18 villages that are still inside the National Park. Since the formation of the Kanha National Park in 1955, of the 45 villages inside the protected area, many have been relocated to outside the park boundaries but some villages are still deep inside the core zone, co-existing in the wild along with the other inhabitants of the jungle. For them, dangerous walks like these are part and parcel of everyday life. And for those who take up a job with the forest dept. as patrolling guards, these dangerous walks are required to eke out a living. It was one such forest guard who had a fateful encounter with a tigress circa 2006. The tigress was with cubs and the man was looking for the camp elephants that are left loose every morning. The morning mist was thick and he came too close without noticing the tigress’ presence, she charged at him. He shooed her away with his useless baton, she left but she came back again. He shooed her away once more. The third time she didn’t back down and he didn’t survive. All the while, the poor man was relaying the information on his radio transceiver to the office but before help could arrive, the tigress tore his head apart. A chill ran down my spine as Omkar Singh narrated this story. His eyes were apathetic and he wore an expression that seemed to have accepted this fate as normal. He went on to tell me, when tourists visit they joke around, saying where’s the tiger? They don’t seem to appreciate or acknowledge its power, not of the tiger and not of the jungle. He said, it is easy to think the forest is beautiful and harmless sitting inside the safety of the vehicle but take 10 steps inside the forest, off the trail and you will see how scary it really is. I could easily relate to this thinking of my several hiking excursions into the jungle on foot. But of course, there were no predators and I wasn’t alone and yet it was scary. Walking in the same jungle where a Tiger walks is no mean feat, yet these people do that every single day. The villages in the core, buffer zones and the immediate surroundings of the park often report cases of Tiger hunting their cattle. With little means to support their livelihood, the villagers are in favor of killing the tiger when it attacks. When one’s livelihood is at stake, how will they bother about conservation? Although the government provides compensation for such cattle kills, we all know how well the good schemes on paper are implemented in reality. 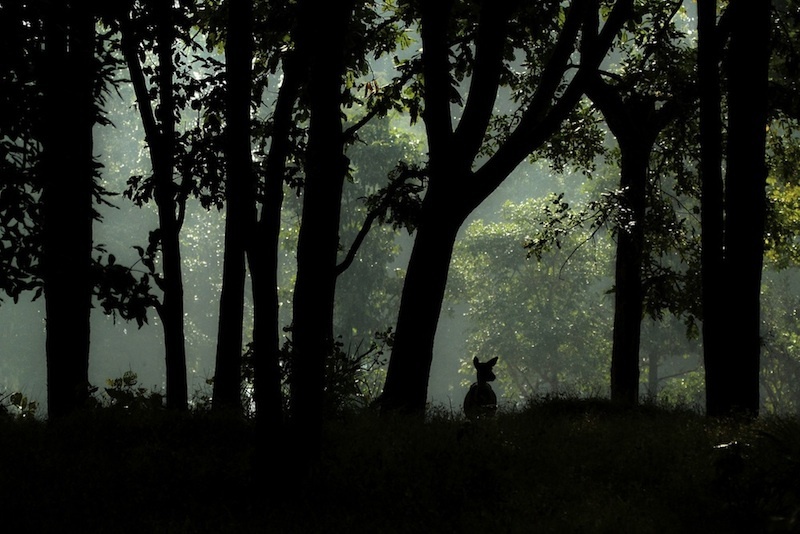 When I went to Bandhavgarh from Kanha, I was in for an even bigger shock. I had heard of these villages inside the core zone in Kanha but hadn’t seen any. In Bandhavgarh, during my safari in the Taala Zone, we passed by a village! The village was enclosed in a rickety fence not more than 6 feet high. And I saw fresh tiger pug marks just outside the fencing and apparently a tiger can jump over 12 feet high! I can only imagine the sleepless nights in a village like this. To make matters worse, there’s a highway between the two core zones and the tigers keep crossing this road it seems. True enough, the same day we spotted fresh pugmarks again on the road signaling a tiger had crossed over. Just few years ago, guests didn’t even have to enter the park it seems. Sightings were so regular just on the road. It left me in a melancholic mood, thinking how we have destroyed all our precious forests and now we are inching towards a dangerous situation of shrinking habitats and an impossible coexistence between the man and the animal. On my last night in Madhya Pradesh in Bandhavgarh, I was discussing tigers around the campfire with the naturalists at the wild Treehouse hideaway that shares its boundary with the core Taala Zone. Ajit, a senior naturalist there asked us to calm down to listen, the alarm calls of deer were ringing in the forest suggesting the presence of a Tiger in the vicinity. He then tells me he’s encountered Tigers many times even within the property. Treehouse Hideaway intends to give the traveller a wild experience and it sure does! They often listen to the roars of the tiger. Ajit saw his first tiger when he was 16, in the jungles of Terai on a hunting expedition and he isn’t baffled by tiger encounters, even when he’s on foot. Shivraj, the very young naturalist recollects his fond memories of running into the jungle with torches in the night whenever they hear the alarm calls! What a strange world I had stumbled into! There were people who were living with the tigers because they didn’t have a choice and few made the choice to live with them. On our way back to Kings Lodge, the headlight of our vehicle shined into the eyes of a pack of jackals raiding a village. We stopped while they quickly disappeared. I could hear the faint alarm calls of the deer again, the moon was shining bright and high and I was sad to leave the jungles of Madhya Pradesh. But somewhere deep inside, I was happy that I didn’t have to live with the tigers. Wonderful! I loved the pictures. They have an eerie quality. So true...we are lucky that we don't live with the tigers! It's good to be on the other side. That was a bone chilling account, Neelima. When I went to Kanha, I was told that all the villages from the core zone have been relocated but maybe that's not really the case. I saw villages in the core zone of Tadoba in Maharashtra though, but some part of me wasn't yet ready to hear about the fear they live with everyday. It baffles me though, why people must've chosen to settle down in the middle of a dense forest all those years ago! Thanks Shivya. Well I guess in those days every village was surrounded by forest and there was enough space for animals and humans to live peacefully without encroaching into each other's territory. But unfortunately it's a completely different situation now, no space for animals to hunt freely and no space for cattle to graze. I just can't imagine living in those villages inside the park, must be how restricted! Thanks Kaushal, glad you enjoy my writing. I will check out your blog. I can imagine how scary it must be knowing wild animals are around. Interesting account. I had actually heard of the Tiger reserve in Kanha national park beforehand, so it was interesting to read your accont. I just came across your blog today (I found you thrugh twitter). Currently I'm travelling in Nepal, and like you, enjoy travelling off the beaten path. My next destination is India, so I am looking forward to getting through the wealth of information on your website about the less touristy destinations! Actual life in Jungle is cant be imagined by sitting and watching discovery. Thanks for sharing such a nice post and bring a fresh perspective. I really like the starting line "It is easy to think the forest is beautiful and harmless sitting inside the safety of the vehicle but take 10 steps inside the forest, off the trail and you will see how scary it really is" very much. Thanks Rachit, glad you found this post interesting. I have felt the same way, watching the forest from the safety of our homes or a vehicle is so so different from being there in person. Comparing to Pictures, your writing is amazing. Good skill to write.please make write more. i want to read more. Well you see that's the problem, if government wants to relocate people from the villages where they have been living for centuries, they must give enough incentive to move out. Leaving them inside also doesn't make sense when we are encroaching upon wild lands so much that man-animal conflict is a certain outcome. That's what surprises me, that govt has done so little for these villages. Hi Neelima! Fabulous shots and post!! Hope you are having a great holiday season! Sorry for the absence, but work and concerns are keeping me away from Blogtrotter... Anyhow, enjoy my latest post at Tobago, and have a great season! Thank you! Wish you a lovely 2014 too. Nice account of an amazing experience. You are right, survival always comes ahead of conservation. These village people find it beneficial to kill a tiger, not in one but in many ways. In fact I find the policies of our government self contradicting sometimes. On one hand our government wants to protect the tigers while on the other hand the guards in these parks are underpaid. On one hand our government wants to keep the jungles intact while on the other hand runs a highway from the middle giving poachers and smugglers easy access to the forests. Ironical, isn't it? Hi Neelima. I have been reading your blog for many months and what a wonderful blog. However, this post, and mostly its comments, compelled me to add my comment as well. I have worked with conservation and issues related to it. I have seen and experienced this with my own eyes. India has less than 5% of its land mass as protected forest today. (I also hear of a 1% forest number). Considering that the landmass started with forest, human settlements have cut down and destroyed 95% of that forest. (Imagine someone occupying 95% of your house against your wishes). Hence the need to conserve whatever is left, because if we are to measure with human-selfish yardsticks, forests give us oxygen, medicines, water, relief, prevent erosion etc. About the villagers: The government has a very good policy for relocating villagers. They are either given a sizeable chunk of village land or Rs 10 lakhs per adult head of family. Thats a huge sum of money for a village economy (or a non-existent forest economy). You can buy agricultural land in many rural places at the rate of Rs 1.5 lakhs per acre. Many of the villagers have moved out. Some stay back trying to negotiate a larger amount, that's human greedy nature. They are better off outside of the forest, where they have access to electricity, schools, village hospitals, roads, the basic human economy etc. As far as I know, there isn't much corruption in handing out this money because the project tiger is a very high-profile project and has the world's attention to it. Some villagers take the money and resettle in the forest, hoping for more money. They are also given reasonably prompt payment for loss of cattle. As a matter of fact, they are NOT allowed to send their cattle to the forest for grazing. The government has allocated special grazing land, which these villagers don’t manage, and soon their cattle turn them into eroded, infertile wasteland. - the villagers' cattle overgraze the forest, leading to loss of habitation for resident herbivores, soil erosion etc. Once the grass is gone, the villagers start cutting tree branches to feed the endless hunger of the cattle, a process called 'lopping'. (You will find trees that look like babies' bottle cleaners, with all branches cut). These trees, unable to flower and seed, and devoid of enough leaves for photosynthesis, eventually die. - the buffaloes destroy water holes in the jungles by lying in it and urinating and poo-ing in the same waterhole. No other animal does this, and these waterholes are abandoned by resident animals looking for clean fresh water. - the villagers, (at least some of them), however much they would deny, take part in poaching of various animals, including the tiger. Because no one knows the forest better than them. And illegal wildlife trade is one of the largest illegal trades in the world, along with illegal narcotics and arms trades. This is another reason they want to keep living inside the forest. - as the village population increases, they cut more forest to make way for more homes, more cattle etc. - they regularly cut forest wood, grass, and fruits, creating a huge resource crunch for the wild species, who have been left with little or nothing to feed and live on. When the grass is gone, the chital stop breeding, because they need the tall grass to hide their fawns. With the chital gone, the large carnivores have little to feed on. To save the remaining <5% forest cover, its essential to move human population outside. The government has excellent policies which ARE being implemented, but it takes time. Wild animals do not, repeat, DO NOT attack humans unprovoked. The forest guard who was killed by the tigress in a very unfortunate incident, was unlucky to have startled a possessive mother with cubs (imagine some scary person startling and scaring your children). If one keeps a substantial distance, often around 20 metres, from a wild animal, one is safe to walk the forest. Just be alert and make sure you don't startle any animal. On the other hand, search the net for man-animal conflict images and you will find hundreds, where poor animals are mercilessly killed by hordes of jubilant villagers, instead of being given a safe passage. Roads through forests should not be allowed. The Ministry of Environment and Forest and other Forest and Wildlife scientists keep asking for shutting down the forest roads, but powerful ministries in other departments (infrastructure etc) always get their way. One good idea has been to build fly-overs through forests, as ground level roads kill many hundreds of animals in road accidents every year. But somehow, this thought hasn't found much traction in the required ministries, apart from MoEF and wildlife. Strange feeling crept in while reading about the "core" area of the jungles. It is truly unbelievable how generations of mankind have lived with such carnivores. It somehow reminded me of the movie Kaal!